Florida Realtors really want you to know what a successful Legislative Session looks like. 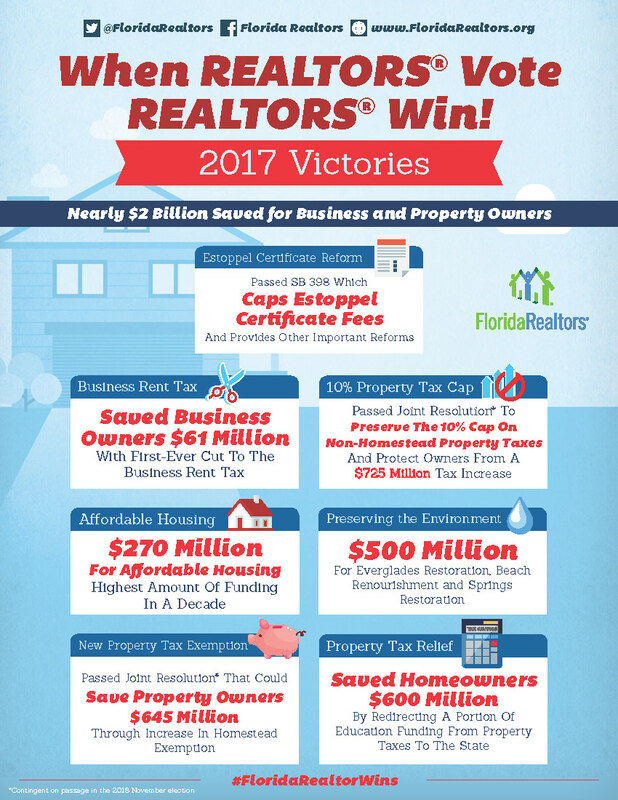 To celebrate the close of a “triumphant” 2017 Session – including passage of the state’s $82.4 billion budget – Florida Realtors released a recap of its major victories, bills and budgetary items of interest to real estate professionals statewide. Florida Realtors 2017 president Maria Wells says: “Your investment in the Florida Realtors PAC ensured Realtor-friendly legislators were elected. During committee weeks and session, you made your voices heard in the public policy process, making the difference for Realtors to celebrate a victorious year on our key issues in Tallahassee. The 2017 Legislative Victories document conveniently concentrates the group’s productive 60-day-plus Session into a simple, easy-to-read format, outlining important property rights wins such as a cap on estoppel certificate fees, the first-ever reduction in business rent taxes, added homestead tax exemptions and a 10 percent cap on non-homestead property taxes. Realtors also congratulate the Florida Capitol for passing bills to fine tune condominium termination laws and provide additional oversight for condo boards. Lawmakers also funded affordable housing workshops, and offered up to $500,000 to the Department of Business and Professional Regulation to combat unlicensed real estate activity. Other triumphs include tax exemptions for disabled first responders, providing a 100 percent homestead tax exemption for those totally and permanently disabled in the line of duty, tax breaks for businesses using rooftop solar and other renewable energy devices, and a push to grow the private flood insurance market. And in some cases, when bills fail, Realtors see it as a win anyway, as in the case of the establishment of mandatory time-of-sale septic tanks inspections. HB 285 from state Rep. Randy Fine and SB 1748 from Sen. Linda Stewart were amended to require just disclosure instead of an inspection, later changing them to shorten disclosure language. Nonetheless, both bills did not garner sufficient support before Session’s end. Realtors were also disappointed by the failure of lawmakers to restrict local regulation of vacation rentals. In 2014, the Florida legislature gave municipalities the ability to regulate vacation rentals. While cities and towns cannot prohibit vacation rentals, or regulate duration or frequency, they are free to impose new ordinances. In cities and counties around the state, these ordinances have resulted in unreasonable burdens on vacation homeowners. HB 425, from St. Cloud Republican Rep. Mike La Rosa, would have mandated that if a municipality adopts a new restrictive ordinance, it must apply to all residential properties; vacation rentals could not be singled out. While HB 425 passed the House, it died on the Senate floor.